If you follow OnTrac’s Twitter or LinkedIn feeds, you’ll know that we’ve been raising awareness of National Apprenticeship Week by focusing on our very own software development apprentices, and showing our support for the wider Tracsis group, the rail industry and technology sectors, by sharing stories, quote and statistics. QA Apprenticeships helped us source both Saul and Will – known by our tech team as The Mavericks – and the course allows them to combine classroom training, with online coaching, as well as the hands-on experience they get with us here at OnTrac. With a choice of specialising in Java or C#, the lads opted for Java and at the end, will have qualifications that will set them up for their software development careers. Before joining the OnTrac ranks, Saul’s reputation preceded him, with many OnTrac employees (OK maybe just me) practically giddy at the prospect of a gaming expert joining the ranks. Saul plays Call of Duty, Fortnite and FIFA 18 competitively in his spare time, and ranks quite high in Europe! He has inspired the rest of us to up our gaming abilities, but alas, none of us have quite achieved the giddy heights of excellence just yet (only the muddy waters of frustrating failure!). What inspired you to choose an apprenticeship? Saul: I chose to do an apprenticeship, because I think they’re a great way to progress as a person, and academically, without the safety blanket of a school/sixth form environment. It forced me out of my comfort zone, which is one of the best ways, in my opinion, to become a better allrounder. Why did you choose software development? Saul: The reason I chose software development was because I was already very familiar with computers prior to the apprenticeship. But, I had never tried anything to do with programming, so it seemed like a good opportunity to learn a new skill in a very demanding field. I knew that programming involved a lot of problem solving, which is also something I really enjoy doing. How have you found working for OnTrac so far? Saul: I’ve found working for OnTrac has allowed me to evolve as a person, and learn more rapidly than in a school environment would. Improving my willingness to learn new things, along with my confidence, it has also given me a sense of responsibility. What are your aspirations following your apprenticeship? Saul: one of my main aspirations within my career is to come into a company as an apprentice, and gain the qualifications needed to work my way up within a company as early as possible. I want to always make sure that whenever work comes my way, I’m completing it to the highest of standards. Being the oldest (and potentially most quiet) apprentice, Will had his eyes opened when he was thrown in at the deep end on his first OnTrac trip to the races. Exposed to the wider development team outside of work, Will was bestowed the moniker ‘Savage’ and, like anyone else who comes face to face with the OnTrac developers, has no idea why. Will is also a gamer, and his weapon of choice is the might computer. He plays CSGO and Fortnite – two things that I had to Google to discover what they were (showing my age, there) – and likes to socialise with his friends, watch the latest films and listen to the latest music! Will: I think that the experience that can be gained in the workplace is extremely valuable, helping improve employability in the future. I also learn best in a hands-on environment, rather than watching presentations and copying out of textbooks. Apprenticeships give you the experience of working in your chosen field, while gaining a qualification to use at the end of it, which suits me. Will: I’ve been interested in computers since I was a young child, and this interest has only grown over time. When I was a teenager, I built my own computer, and soon became interested in programming. It started off with simple game development, which lead to an interest in programming languages, such as Python. I’m fascinated by the capabilities of technology and would love to work in one of the world’s biggest industries. Will: I have thoroughly enjoyed all of my time spent at OnTrac so far. Everyone is very friendly; help and guidance is always available, should I need it. The company culture is quite laid back, but everyone is very hard working and motivated. Will: Following my apprenticeship, I would like to work towards becoming a full-time software developer, and further developing my programming skills to higher levels. “At OnTrac, our main driving force is the people who make up our team. There are people here who have been with us since the beginning, and we’ve supported them in helping them build their careers. 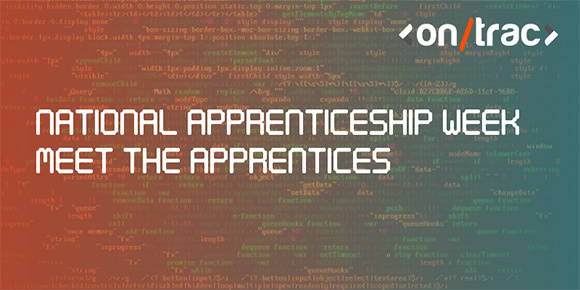 OnTrac, alongside the wider Tracsis group, will be expanding their apprenticeship scheme moving forward, hopefully expanding into other areas of the company too.